Thousands of freshly minted Minnesota high school graduates wouldn't have gotten a diploma this year without a waiver from the state because they repeatedly failed Minnesota's math requirement. In some districts, as many as one-third of seniors wouldn't have graduated because they didn't pass the mathematics graduation test. About 57 percent of students pass the test on the first try, but no one knows how many of those who fail are successful when they retake it. Losing the waivers would devastate graduation rates across the state. Minnesota education officials are scrambling to come up with an alternative before the provision allowing the waivers sunsets during the 2014-15 school year. State Education Commissioner Brenda Cassellius has convened a task force to assess the graduation test and has indicated that she favors scrapping it. "When you have about half the kids not passing, you know you have to do something," Cassellius said. "You cannot just deny diplomas. There needs to be a Plan B solution." Although it is a lot easier to get the highest score in Minnesota. The actual graduation requirement is a subset of the entire MCA-II. All this indicates that Minnesota has serious problems in math education, right? 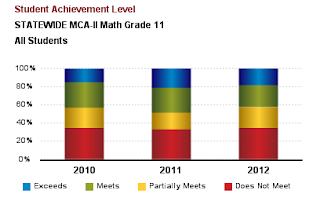 Minnesota is #2 in 8th grade math NAEP. They did very well in 8th grade math when ranked internationally in the 2011 TIMSS. They're #2 on the SERI rankings of how well states are "preparing their students for science and engineering careers." What's happening is we're observing that setting higher standards does not have a direct effect on student achievement. The Green Lantern Theory doesn't work. Didn't know about this. Thanks. Yeah, I was just wondering what some of the other high performing math states did, and the first one I looked at turned out to be surprisingly familiar.